One of the hardest, and certainly the most awkward, part of being on a volunteer committee is having to chase members up for money that they owe the club. It can be a very sensitive topic, and becomes hugely time-consuming over the course of a year. Our philosophy at Majestri has always been pretty simple - people will generally do what you are asking them to do as long as you don't make it too hard for them. Throughout the system, we do our level best to take away roadblocks from your members, and we've probably put the most effort in here. Let's take a look at some of the facilities we've built that helps your club keep on track of all money owed, plus the lengths we've gone to to make available the most efficient money-collection tools you're ever likely to see. On the Financials tab in the Control Room, there are two separate links that will take you the Outstanding Debts screen. Both links are functionally equivalent - the second link has the implicit information of how much money is owed across the board (ie. from all events past and present, and shop orders). The main screen shows all members, in alphabetical order, who owe the club money. It's important to note that each debtor may have one or more invoices outstanding with the club. Only outstanding invoices are shown with each debtor. 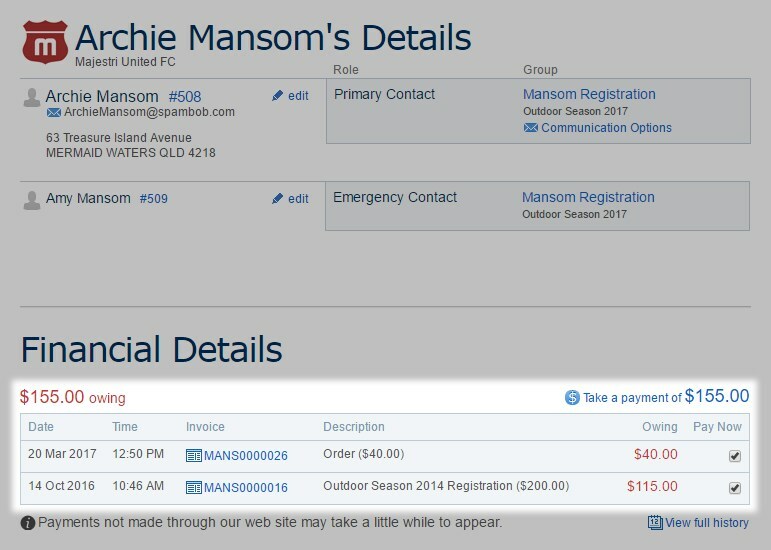 To see more detail about the original invoice and what it was for, you can click on the View Detail button. 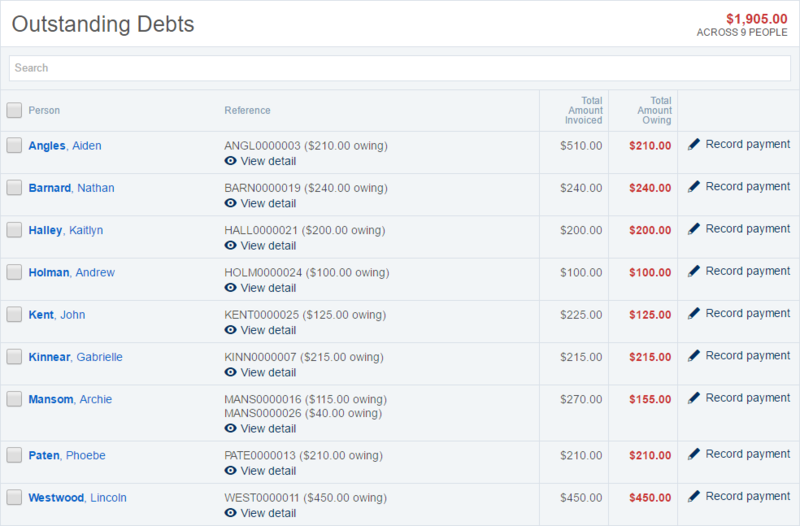 When clicked, a popup will appear that shows the detail of each outstanding invoice. 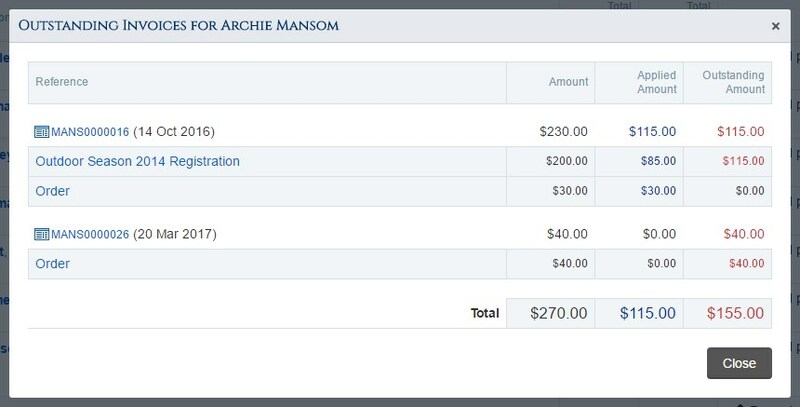 If you are manually receipting a payment that has been made by somebody on this list, then you can click the Record Payment link on the right hand side to do that. This is probably one of the best features of the system. Because chase-ups are performed by the system on your behalf, it takes all of the awkwardness out of the situation and makes it more impersonal. Every debtor listed has a checkbox to the left of their name. As soon as you have checked one of these boxes, you'll have one of our Majic Footers fly up from the bottom. 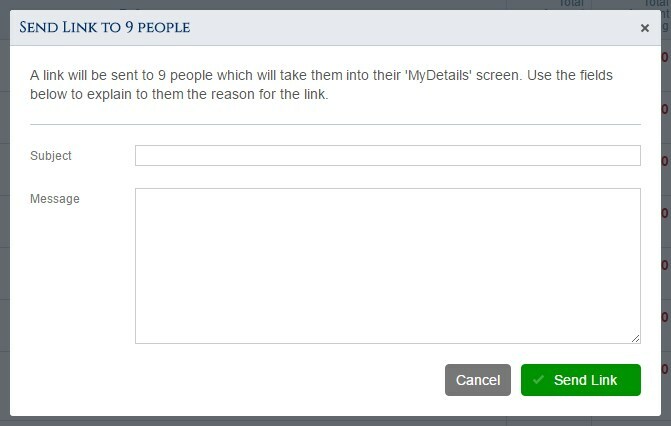 By clicking on the "Send Link" button, you'll be able to issue a system-generated email to all of your selected debtors. A popup will appear that lets you tailor some parts of the email. What does it looks like from a member's perspective? You can see from the sample email that it's all very business-like, with your own verbiage being added to the message. Everything is geared towards them clicking on the link in the email which will take them straight into their My Details screen. Again, it's all about removing roadblocks - this link bypasses the need for a username and password. 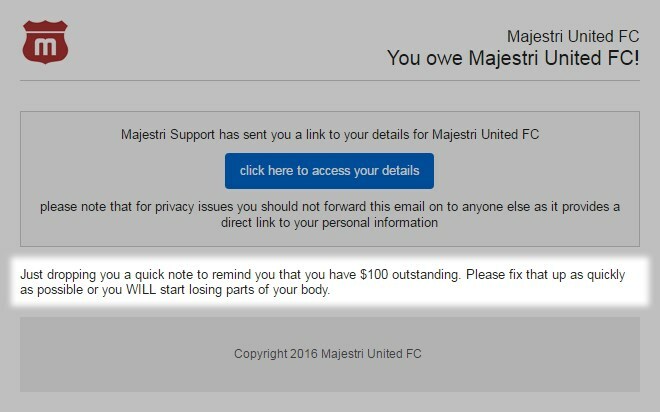 Members who owe the club money have this outlined very clearly on their MyDetails screen. Once receiving this notification, the majority of your members will go ahead and make a payment using their credit card (if allowed) to clear their debt. We have collected enough anecdotal evidence over the years to know that this is the most efficient way to collect money from your members. Of course, there is a cost of collecting money this way, and we clearly outline our charges on our Pricing page. It's entirely understandable that clubs want to keep their costs down as much as possible, and it's certainly reasonable to simply use this mechanism to instruct members to settle their debt by EFT or by bringing cash or card down to the club next time they're there. Putting roadblocks up for members comes with its own cost though, and since this method is nowhere near as efficient, it's likely that it'll be your volunteers who will ultimately pay for the inconvenience with their time. We've also included a couple of exports here that will allow clubs to take the data off-line so they can see what they need to see. This extract will produce a CSV file that contains one line per member. In other words, it aggregates the total of all outstanding invoices into a single amount. Alternatively, if you care about the age of some of these debts, then this is the perfect extract for you. It produces one line per invoice, so it's a simple matter to order the data in Excel by invoice date to see who has the oldest debts with the club.